Last weekend, my boyfriend decided that he wanted to have a trip to Whitby since I wasn’t working. 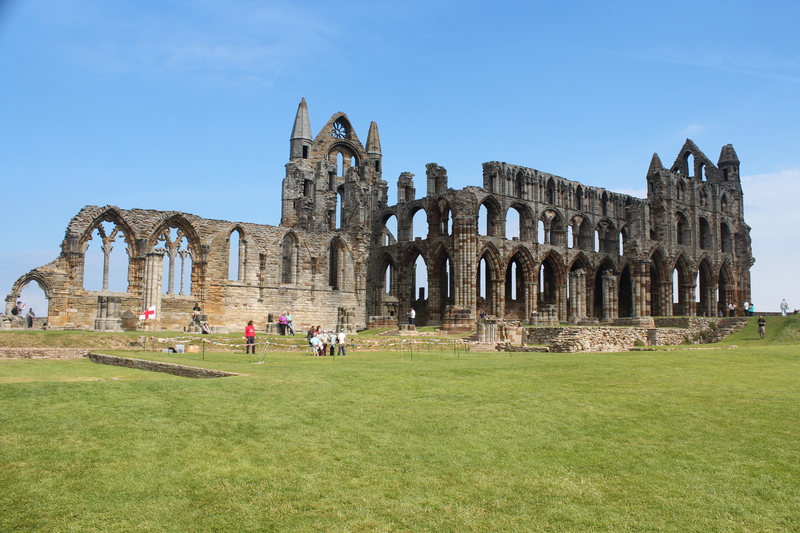 Since I only live one and a half hours away, I have visited Whitby many times, but since my comes from Skegness, he has only visited it once, and had never been to the Abbey. So we set out on Saturday morning and the sun was even shining as we made or way over the moors to Whitby! Once we had arrived (and finally found somewhere to park!) we wandered through the old town in the direction of the Abbey. One stop that I simply had to make on the way was a trip to Bobbins, whose sign claims it to be ‘a knitters paradise’ and it certainly is! Located inside an old hall, the room is crammed full of baskets of luxurious wool. Be prepared for an expensive visit though, they don’t stock any cheap yarns! I just wanted to share with you my first article that I have had published as a feature writer for Karoo! I’d love it if you had a spare moment to check it out! Thank you! World Book Night is celebrated on 23rd April every year. This date is significant as it is the date of Shakespeare’s birth, and to mark it, it has been appointed the national day of the book, which is why it was chosen as the annual date to celebrate World Book Night. On World Book Night, thousands of ‘givers’ are chosen to hand out twenty-five copies of their chosen book COMPLETELY FREE, to people who usually don’t read. In total that makes one million free books being given away to non-readers. This year I was fortunate enough to be selected as a ‘giver,’ and I decided to give away my books to parents at the local Rainbows and Brownies units where I volunteer. I decided to give my books to parents because I feel that it is incredibly important to encourage children to read, and the most effective way of doing this is by them witnessing their parents reading. Many of the parents that I spoke to claimed that they didn’t have time to read, or said that on an evening they would rather do something “relaxing” like watching television. While television can prove mind-numbing, it is no less relaxing than reading a book. Ultimately, the conclusion that I drew from this was that the parents were creating excuses why they couldn’t read. So I gave them an excuse to. On the evening when I was handing out the books, many of the parents were incredibly grateful to receive it. I had chosen Bill Bryson’s ‘Notes from a Small Island’ to hand out, as I felt that it would appeal to non-readers in two unique ways – it is non-fiction, and it is an easy-going read. I didn’t feel that handing a Dickens novel to a non-reader would encourage them to read much, as even I – an English student – can find Dickens challenging at times! It also has the appeal of being about Britain, which is a particularly strong theme currently with the Queen’s Diamond Jubilee and the fast approaching Olympic Games. The most grateful recipient of my book was determined to give me a donation for the book I was giving her and I had to assure her several times that no donation was required or would be taken under any circumstance. She was so thrilled to be given a book for free as she did enjoy reading but found little time to do so – now she fully intends to make time! However, some people were less willing to take a book from me, even if it was free. One woman didn’t want to take the book as she said she wasn’t a very strong reader, but I assured her that she wouldn’t find it taxing and she ended up staying for the whole meeting, sitting in the corner reading! She said that she would have to get her nine-year-old daughter to help her with it as she was a better reader, which made it even more special as she is able to share the beauty of reading with her daughter, and they both have the ability to learn together. Another man initially turned down my offer of a free book and walked away very quickly, but when I asked him when he returned for his daughter, he looked slightly more interested, picking up a book to have a look at it. I assured him that he would probably enjoy reading it, and he eventually agreed to take one, commenting that it might “inspire” him. The most rewarding thing I experienced when handing out my books, however, was the reaction of the girls, who were aged between five and nine. All of the girls are naturally very inquisitive, so they were incredibly interested in what I was giving out. However, what went beyond the natural inquisitiveness was when they started coming and questioning me and asking, “Did my Mum take one?” “Did you give my Dad one?” and the prospect of getting a free book, even though it was way beyond their reading ages, was exciting for them. It was wonderful to see how many of the girls wanted to look at the books and talk to their parents about them. So if I have achieved anything from giving out twenty-four free books (only one was left unclaimed!) I hope it will be to have got twenty-four girls excited about reading, which will hopefully be encouraged by their parents. My love of books stems from years of having witnessed my Nanna reading, a love which transferred to my Mum and then to me. I hope that the parents I have given these books to will enjoy them, and their children will see them enjoy them, so that they themselves can discover the joys of reading through their parents. 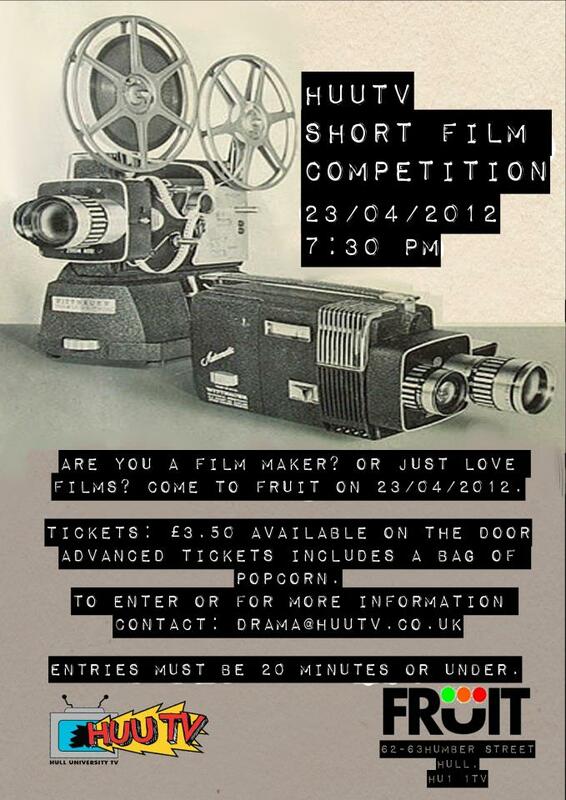 Last night I attended the HUUTV Short Film Competition for students of Hull University and the local colleges. 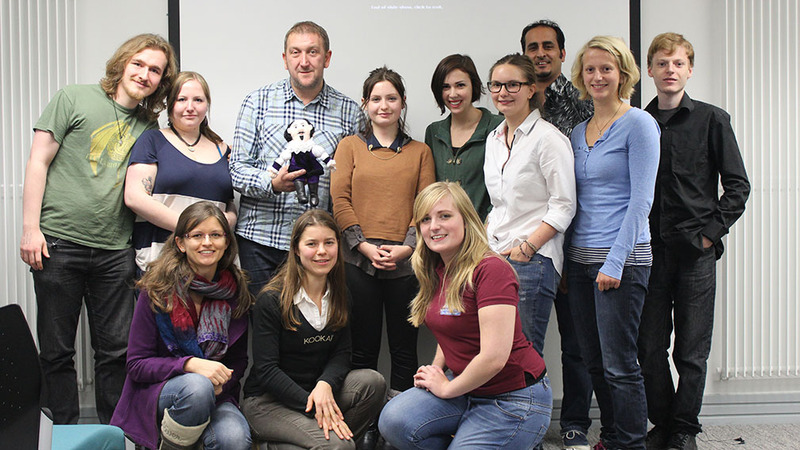 HUUTV is a television station run by students of Hull University. The event took place in Fruit, located in the old Fruit market of Hull, which is now becoming the hub of unique arts and crafts events in the city. Fruit was an apt location for the Short Film Competition, as it is renowned for hosting its Cult Cinema Evenings and Horror Fests. This fantastic opportunity let the students films share the screen that has presented some of the most famous Hollywood classics. You cannot help but be amazed by the quality of the films, which students are responsible for writing, filming, directing, acting and editing. The films fully represent a student’s outlook on life, which makes them incredibly unique. 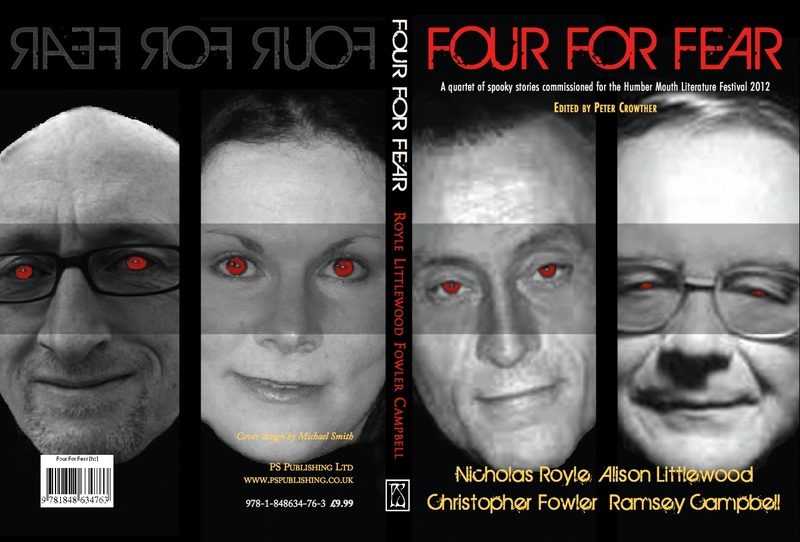 A full spectrum of genres is covered, from comedy to drama and tragedy, even science fiction. This event covers such a range of themes, issues and ideas, which makes every one of the films contrast from the others. The winner of best film was ‘Lost Inside,’ which was directed by Shay McGrear. It was the worthy winner after producing an emotional silent film about a girl who struggles with agoraphobia, a fear of going outside. It is a wonderfully captivating film that is truly touching and was of professional standard. It was chosen by the four judges, including Hull’s Lord Mayor and Lady Mayoress. However, the audience vote went to ‘An Expedition,’ a comedy about Shakleton’s failed expedition to Narnia, which was incredibly entertaining, and also took the ‘Best Script’ award.